Jim Burr will present the latest discoveries in space on Saturday as well as insights the Bible has on the creation of the universe. 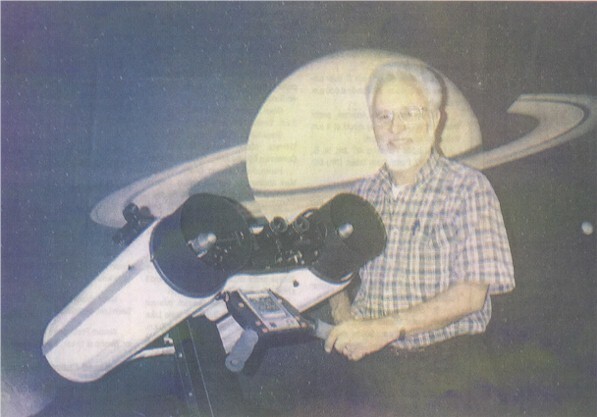 He is pictured next to his latest invention, a small binocular telescope. His presentation will show the latest images retrieved by the Hubble telescope. Along with this, he will show how scripture from the Bible, once thought absurd 200 years ago, is up-to-date today. "By the time the Bible was written, the stars were counted at 5,000." Burr said. "We have now counted 7 sextillion stars." One passage of the Bible states that the stars in heaven are as plentiful as sand on the seashore. The big bang theory that explains the origin of the universe will also be discussed. Recent articles have rewritten the big bang theory. "Everything you've been taught in school about the big bang is wrong," Burr said. Burr travels around the country and world, delivering 100 lectures a year on space and the Bible. He doesn't run into much opposition from religious or scientific circles. He can only recall one group of atheists in California that shook their heads and challenged what he was saying. Recent research in space exploration may debunk many current theories. Burr said we may know less than nothing scientifically. Burr was born in Sauk Centre and has family in the area. Burr will present "The Hubble, the Bible, the Big Bang," at 7 p.m. Saturday at Pebble Lake Seventh-day Adventist Church in Fergus Falls. Jim Burr of Colorado has a fascination with space. Since he was a young boy and saw a slide show of pictures of the universe, the seed was planted to lead him into astronomy. Burr is the president of Jim's Mobile Inc. of Lakewood, Colo. The company designs and creates telescopes and after-market accessories. The beginnings of his company can be traced to a telescope he built after taking a college course. When he tried to adjust the focus, the telescope wiggled too much. In 1983, he invented a focusing device and started his business, which now sells $1 million to $2 million of telescope proucts annually. His company employs 18 people and recently even sold a 25-inch telescope to NASA which may be used in an upcoming Mars mission. According to Burr, the Bible has a lot more insight on the mysteries of the universe than one may initially assume. He will be in Fergus Falls Saturday to give a presentation entitled "The Hubble, the Bible, the Big Bang."